In 2017, we launched an expansion to bring the eSchool 360 program to 35 additional schools in the Eastern Province in Zambia. This initiative has been funded through the Board of American Institutes for Research (AIR), whose members visited the pilot program in Zambia in the spring of 2016. AIR will also design and implement a cluster-randomized controlled trial to determine the impact of the program on children’s learning outcomes. These efforts will bring a quality education to 3,500 additional children in 35 schools across three districts of Zambia’s Eastern Province, and build important evidence on the effectiveness of the eSchool 360 program across three districts in Zambia. In 2013, we completed our initial pilot of the eSchool 360 program across 9 schools in Katete District. After launching the expansion project, we continue to work with these initial schools to pilot new innovations that have the potential to help rural community schools across the country. Learn more about the initial schools here! Joel Community School serves 245 students in Joel Village. It was our first school, initially constructed by David Seidenfeld during his time in the Peace Corps. Future blocks were sponsored by the friends of co-founders David Seidenfeld & Michael Weiss, Brent Metz, the Addax & Oryx Foundation, and the Japanese Embassy in Lusaka. Kanyelele Community School serves 330 students in Chapita Village. With funding from Gregory Perlman and friends of Impact Network, Kanyelele opened its doors to 100+ Grade 1 students. In 2014, a second school block for upper primary students was added with funding from the Addax & Oryx Foundation. Kalowe Community School serves 102 students in Nyambo Village. It was built with a matching gift from Jesse Lipson and Brooks Bell. After Kanyelele was successfully operational, word spread quickly and many more schools came into demand from the communities. Mnyaula Community School serves 269 students in Chipapika Village. Impact Network built this school with support from the Goggio Family Foundation. In 2014, a second school block for upper primary students was added with funding from the Addax & Oryx Foundation. Mkale Community School serves 201 students in Msonda Village. A generous gift from Howard and Wendy Lerman helped to bring this school to fruition. In 2016, a second school block for upper primary students was added with funding from the Japanese Embassy in Lusaka. Mkhazika Community School serves 185 students in Kulanga Village. Mkhazika became our 6th school with generous support from the Patel and Zalavadia families. In 2015, Noah Schick and his family fundraised for a second school block serving upper primary students. 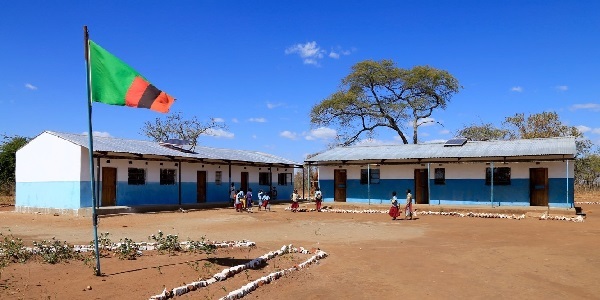 Zatose Community School serves 220 students in Chisulo Village. Zatose was constructed in late 2012 with help of board member, Stephan Spencer. In 2016, a second school block for upper primary students was added with funding from the Japanese Embassy in Lusaka. Chivuse Community School serves 227 students in Kanyungu Village. It was originally built by the RCZ church and was later adopted by Impact Network when funds ran out. Waseka Community School serves 228 students in Azele-Guze Village. Waseka was originally constructed by Care International. After the school fell into disrepair, Impact Network adopted it in 2013 and implemented the eSchool 360, with support from the Goggio Family Foundation. In 2016, we created a virtual reality experience to bring our supporters inside our schools in rural Zambia. Click here to watch the 360 video and learn more.